We are delighted that Assos is providing our cycling kit for the 2019 season. The innovative Swiss company has been producing the most technically advanced cycling clothes since 1976, when they were the first to introduce Lycra cycling shorts. Since then they have chalked up many other firsts and amply justify their reputation: expensive but worth every penny! The values of Alpine Cols and Assos are perfectly aligned: a constant search for the highest possible standards of performance, comfort and quality. Alpine Cols and Assos: your go-to combination for your toughest rides! Order jersey and bib shorts together and benefit from a €30 discount on the full price (€250 instead of €280). Use the code AlpineCols when ordering. 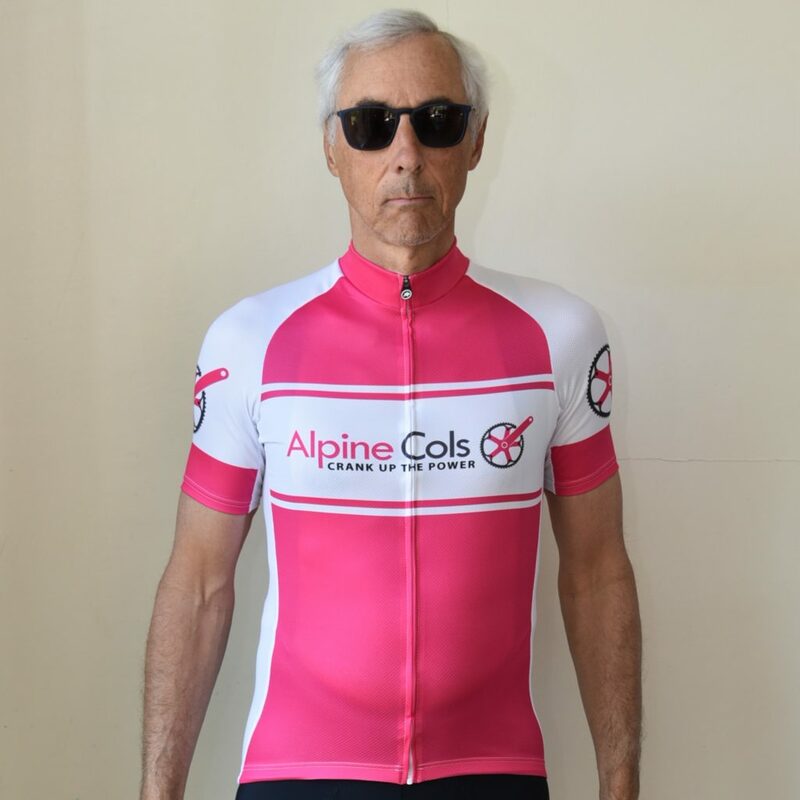 Read below for a description of the new Alpine Cols kit by Assos (text © Assos). Order information below. Perfect for the hottest rides and hardest climbs, this jersey is highly breathable and well suited to summer rides. Depending on the intensity, time of day, weather forecast and altitude of your route, we’d recommend playing with your skinFoil baselayer underneath to tune your outfit. On chillier days, start the ride with arm warmers and a shell jacket. This is a summer short that can become your daily workhorse. The short performs at its best on hotter days, worn with a lightweight skinFoil baselayer and jersey. On days when you demand a little more insulation, it will team with leg warmers or knee warmers and a heavier skinFoil baselayer to provide more protection against the elements.